If it's not here, the tweak is most likely bogus, if it follows the same pattern as in previous games. To verify a setting exists, use the getini console command. If it returns "NOT FOUND," it is bogus. (Side note: settings with a u-prefix always returns an "UNKNOWN TYPE" value. This is normal and the setting is still valid.) Also note that there is a SkyrimCustom.ini that is believed to function the same way it has done in previous games (overwrite Skyrim.ini, but not SkyrimPrefs.ini). Plugin INIs have not been tested. I have settled for the same definition of "Default" as I used for the original Skyrim, i.e., the value used when the setting is not explicitly stated in the INI files. Do NOT use these as your INI files. This is for reference only at this point. Update: It appears that the saveini method of retrieving valid INI settings fails for SkyrimPrefs.ini, therefore some bogus settings have been included below until I can remove all the bogus ones! With this development, it is possible that there are SkyrimPrefs.ini settings that exist that simply are not listed here! Update2: I have removed the very few bogus settings I could verify through the console, which happened to only be the NavMesh section, which was also erroneously in the original Skyrim. I believe that this INI file IS complete, but I have no way to verify that for SkyrimPrefs.ini. Skyrim.ini, however, is provided here in its entirety. strPluginsFileHeader=# This file is used by Skyrim to keep track of your downloaded content. sGamepadDisconnectedMessage=Please connect a controller to continue. sSaveGameGameVersionOutdated=This save game was created on a later version of Skyrim. Please download any updates. Can't wait to tackle these INIs, as they look to contain a treasure trove of tweaks, a number of which we can recycle from the previous Skyrim. I have tested, and can confirm that the old 255 character limit for values has been removed, most likely due to the program now being 64-bit. Wait, the trick of deleting Skyrimprefs.ini before starting the game to have it restored fresh with only valid setting isn't actually valid ? I was pretty sure that's how you proceeded in previous versions of the game. Ths gave me the very same content as the SkyrimPrefs.ini posted in OP. Edited by Kesta, 05 November 2016 - 06:09 PM. Yes, that is how it worked before, but it now adds the navmesh section, which is invalid. 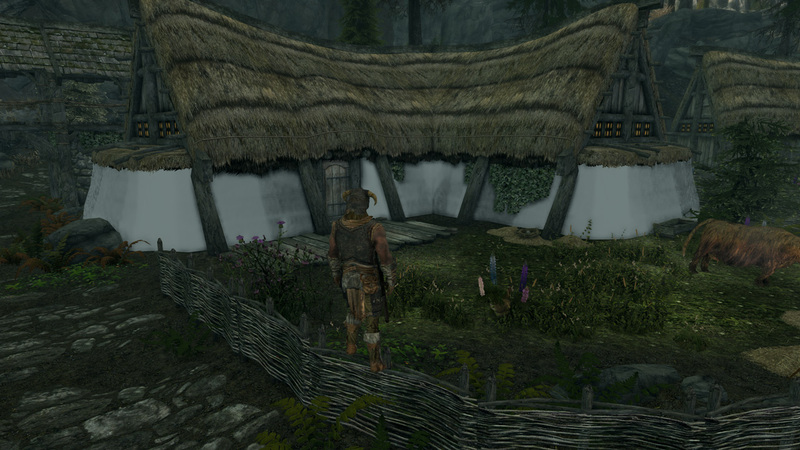 FYI, turning off Grass Shadows via bShadowsOnGrass in Skyrim.ini disables grass, which means that grass shadows are forced. This sets the distance from the player from which highly detailed shadows are cast. If set to 0, your shadows will look like crap. Some people recommend increasing this beyond the typical 2000 (and I may join them once I test a bit) to help decrease the visible line between the detailed shadows and the faraway shadows. Since it stretches the shadow map across this distance, it has no performance impact, but causes the resolution of the shadows to decrease. This toggles image-based lens flare, most commonly seen on candles. It has little performance impact (around 1% decrease in fps, probably dependent on how many lights are around). There are related settings in Skyrim.ini under display that can tweak this effect. From my testing, I believe this enables "Indirect Lighting." This lights up some places that would otherwise be unlit without it. It heavily impacts performance (decreased fps by 15% for me), which is probably why it is disabled even in the ultra preset. I did not observe any bugs with it, but it really doesn't improve the game appearance IMHO, and is a real performance hog. This setting enables a special kind of ambient occlusion effect calculated in real time that is rather buggy. Lighting will change in a room dependent upon where you are looking. It require ambient occlusion (bSAOEnable) to be enabled. It's performance impact is about 4% decrease of fps. Toggles ambient occlusion. You want this on. Performance impact is virtually nonexistent, and it vastly improves appearance. Toggles volumetric lighting (i.e., Godrays). Most people will want this on, but you can turn it off if you like for a performance boost. It decreases fps by about 7% with iVolumetricLightingQuality set to 2, about 5% when set to 1, and about 4% when set to 0. This sets the quality of volumetric lighting (i.e., Godrays). 0 is Low (~4% performance impact), 1 is Medium (~5% performance impact), 2 is High (~7% performance impact). Setting it to other values other than 0, 1, or 2 will cause Godrays to be disabled. This is a shadow setting that probably has something to do with splitting the shadow map to cause the shadows to have better appearance or something. Not really sure. What I do know is that only values 2 and 3 seem to work, as other values either cause glitchy shadows or no shadows at all. 2 is the most performance friendly. 3 comes at a whopping 10% decrease in framerate. Shadows really didn't look much improved afterward, so I would recommend leaving this setting alone. Edited by SparrowPrince, 16 November 2016 - 10:57 PM. I should also point out that SSAO is a real-time AO method regardless. It was invented by a programmer at Crytek, so I am going to assume the 'CS' part is possibly named after that. I think it involves some sort of sphere calculation, so perhaps 'Crytek Sphere'? I'm bettting the non-CS version uses a more optimized derivative of this method and the outcome was more desirable. Probably totally useless to you, but those are my thoughts. It's merely that I have been reading up on various pointless nonsense for the past few months. Heh! Not all settings need to be present to be used by the game. The default values shown in the OP will be used if no value is specified. Generally speaking, you should only need a setting if you wish to modify its value from the default. I should also point out that SSAO is a real-time AO method regardless. It was invented by a programmer at Crytek, so I am going to assume the 'CS' part is possibly named after that. It stands for "Compute Shader" meaning the calculations are done using compute shaders (a DX11 feature). Just wanted to share a few things here... bIndEnable is indeed like ENB's SSIL but it's terribly buggy, and the noise looks really bad up close. I tried both Heightmap and Parallax Occ Material shader types. When using the latter I tried values for Max Passes/Scale of 8.0/1.0, 4.0/1.0, 8.0/2.0. I tried all of these combinations with SLSF1_Parallax, SLSF1_Parallax_Occlusion, and both SLSF1_Parallax + SLSF1_Parallax_Occlusion together. I used the 4th texture slot, which is where a heightmap should go, but I filled in all the texture slots with the _p texture just in case. Edited by jonwd7, 23 November 2016 - 09:22 PM. Compute Shader was the guess that I had, but I really don't know much about that type of stuff, so I decided to not label it as such yet. Oh yeah UU sure... :P Lol, mine was more imaginative I guess. ;) Thanks jon, I'll leave with 1/2 and a A+ in tinfoil hattery. I was going to ask you if POM was working, so it's great to see you are already onto that. Does it actually even work in FO4? I never bothered to check. It would have been great on terrain.